Untreated windshield glass is not smooth. When viewed microscopically, you would actually see peaks and valleys. These peaks and valleys create surface similar to sand paper. This jagged edge surface connects better with flying road debris which then imparts more force to the glass and causes pitting, chipping and cracking. The peaks also create prisms where light is reflected and refracted causing vision distortion and glare. Water collects in the valleys, depositing dirt, minerals and other material that will stain and etch your windshield over time. With Diamon-FusionR Windshield Treatment there are no more peaks and valleys to catch road debris, distort vision and create glare. The glass becomes much smoother, resulting in a clearer, cleaner and safer windshield. 3 Year or 5 Year Warranty! Warranty includes replacing cracked windshield if needed. Diamon-Fusion® reduces the coefficient of friction and increases the possible weight load of glass by up to ten times, making it much more durable and resistant to normal cracks, chips and scratches. Download the Diamon-Fusion Brochure here. It has been proven by independent studies that a hydrophobic coating such as Diamon FusionR, applied on car windshields and side glass, improves visibility during rainy conditions over 30%, giving an additional second of reaction time to the driver and improving response time by 25%, which translates into an invaluable safety feature. This increased visibility enables the driver to see and respond to road hazards quickly. Your safety can also be compromised by night glare and other vision impairments. These occur because windshield glass is not smooth. When viewed microscopically, you would actually see peaks and valleys. The peaks and valleys of untreated glass can create prisms where light is reflected and refracted causing vision distortion and glare. Water collects in these valleys, depositing dirt, minerals and other material that will stain and etch your windshield over time. With Diamon-FusionR Windshield Treatment there are no more peaks and valleys to collect contaminants, distort vision and create glare. The glass becomes much smoother, resulting in a clearer, cleaner and safer windshield. Those same peaks and valleys of untreated glass cause another significant problem. They create a surface similar to microscopic sand paper. This jagged-edged surface connects better with flying road debris which imparts more force to the glass often resulting in pitting, chipping and cracking. Not only is a cracked windshield unsafe, it is a hassle in time and money that has to be spent to get it replaced. Diamon-FusionR reduces the coefficient of friction and increases the possible weight load of glass by up to ten times, making it much more durable and resistant to normal chips, cracks and scratches. While others may make similar claims, none can produce the test results to prove it, except DFI. (See test results, by Alfred University Institute for Glass Science and Engineering). Helping you save even more time and money, Diamon FusionR lasts much longer, extending that safety benefit and reducing the frequent reapplications required by other windshield coating products. A DF-treated windshield provides additional reaction time when needed: 58 feet in distance when driving at 40 mph. As you can see in the photograph, this 'saving' in reaction time will save lives and prevent property damages. Diamon-Fusion bonds with glass at the molecular level. It changes the surface of the glass, increasing its strength and clarity, and decreasing the likelihood of dirt and moisture to cling to it. Why would I want to use Diamon-Fusion? Diamon-Fusion improves driver reaction time by keeping windshields and glass surfaces clearer. It improves visibility during inclement weather, and reduces the likelihood of damage from small road debris. Diamon-Fusion also allows insects to be easily washed away, and makes ice and snow much easier to remove. It protects against acid rain, corrosion and mineral buildup. It keeps glass looking newer longer and helps you preserve the integrity of your original windshield. Is Diamon-Fusion different from other glass treatment products? Yes! Diamon-Fusion technology is not like those coatings that can peel and blister over time. Diamon-Fusion creates a chemical bond that changes the way the surface responds to anything that could damage or contaminate the glass, making it stronger, more transparent, easier to clean and safer. Is there documented proof that hydrophobic coatings work? Yes! 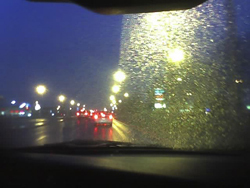 Hydrophobic products have been shown to significantly enhance visibility, according to a study conducted by the University of Michigan's Transportation Research Institute - an independent group which found that a glass treatment applied to the windshield improves visual awareness nearly 34% over an untreated windshield. Please see Improved Performance / Proven Results. Will I still need to clean my glass? Yes, you'll probably want to. But you'll get the job done in less time and with less effort. How can I keep my glass at peak performance? A maintenance solution is available free of charge from Diamon-Fusion Technologies. Will Diamon-Fusion discolor or peel over time? No, it won't discolor or peel, and it remains stable under UV Rays. Is Diamon-Fusion environmentally safe? Yes, the application process is safe for the environment and there's nothing harmful in or on the treated glass. 1. How is the DIAMON-FUSION® process applied? There are two application methods: The first is the ultra efficient batch method (for higher volumes, industrial applications), applied with a vapor deposition system on an engineered chamber (air-tight room). The second method is our NEW wipe-on/spray system which uses a liquid in a hand-applied portable fashion; both create our special "cross-linked and branched, capped silicone films" covered in our patents. 2. On what surfaces does DFI nanotechnology work? DFI nanotechnology chemically reacts with all silica-based surfaces such as glass, ceramic tile, granite and porcelain, as well as other products that contain silica. 4. Once treated with the DIAMON-FUSION® process, will I still need to clean my glass? Yes, you will. The DIAMON-FUSION® coating REDUCES cleaning time but it does not eliminate it entirely. DIAMON-FUSION® is similar to the development of Teflon®* for cooking pans. While you can cook food in uncoated pans, it is so much easier to clean if you cook with Teflon®* coated pans. While you still must maintain your DIAMON-FUSION® coated surface, the time and effort required are significantly reduced. 5. How does the DIAMON-FUSION® process work? DFI's nanotechnology, patented in the US and branded under the Diamon-Fusion® trademark, uses a two-stage chemical process. The chemical reaction created in the first stage causes a "cross-linked" and "branched" ultra thin silicone film (nanofilm) to be grown from below the surface out. The second stage 'caps' the entire chain of atoms. This unique 'capping' substantially increases the hydrophobicity and durability, leaving, chemically speaking, no points of attachment for contaminants and creating a truly repellant charge. Through simple neutralization, all chemicals become inert within a few seconds. No curing time is needed since the chemical reaction itself occurs in less than 2 seconds. 6. What care and maintenance does DIAMON-FUSION® require? Maintenance and care vary substantially according to the type of application (treated surface type and location/exposure) and the abrasion to which the treated material is exposed to. Abrasion means any mechanical (such as windshield wiper on an automobile) or non-mechanical force (such as wind or dust) affecting the treated product. While DIAMON-FUSION® does make treated surfaces water and oil repellent, stain and scratch resistant, among other properties, and lasts for a long period of time (years in most cases), maintenance time is guaranteed to be reduced, depending on the application, by as much as 50% and up to 90%. DIAMON-FUSION® eliminates the need of any HARSH, EXPENSIVE and TOXIC CHEMICAL CLEANING SPRAYS. Your dealership will provide periodic maintenance FREE of charge with DIAMON-FUSION® REVITALIZER. Please contact your dealer for specific maintenance recommendations. DIAMON-FUSION® REVITALIZER is a reconditioner for the DIAMON-FUSION® Nanotech coating. Think of it as a 3,000 mile oil change on your car. It’s that simple maintenance that keeps the engine lasting for years. The same is true for a DIAMON-FUSION® treated surface. 7. Is DFI Nanotechnology environmentally friendly? DFI Nanotechnology is based on an environmentally safe scientific process. The chemicals used in our patented process have been in use for over 55 years (since early 1945) in the aviation industry, for different applications, and are not found in the "Clean Air Act”(1) or the “Clean Water Act”(2). There are also no PELS (permissible exposure limits) set by OSHA (3). We have implemented, with our extreme eco-friendly philosophy, the highest standards in the handling of our chemicals so that any scientific process we may use is safe to the environment. Thus, we have engineered an ultra efficient yet simple neutralization system that renders our chemicals and their by-products completely safe and inert. We strive not only to protect the environment but to preserve it from any contamination or pollution. (1) The 1990 Clean Air Act is a federal law covering the entire United States of America , whereas the individual states (like California or New York ) do much of the work to carry out the Act. For example, a state air pollution agency holds a hearing on a permit application by a power or chemical plant or fines a company for violating air pollution limits. (2) In 1972, the US Congress enacted the first comprehensive national clean water legislation in response to growing public concern for serious and widespread water pollution. The Clean Water Act (CWA), formerly known as the Federal Water Pollution Control Act, intended to “. . . restore and maintain the chemical, physical, and biological integrity of the Nation's waters" (Section 101). (3) Occupational Safety & Health Administration, US Department of Labor: OSHA's mission is to ensure safe and healthful workplaces in the USA . 8. Is DFI's coating colorless? YES. DIAMON-FUSION® is in fact optically clear and is guaranteed NOT to discolor, chip, haze or peel off since the chemical bond created is permanent and integral to the substrate at nanoscale levels. 9. Is there any warranty on the DIAMON-FUSION® product? YES. Diamon-Fusion typically provides a warranty according to the treated product. Warranties are provided independently by each licensee in accordance to each licensee’s respective marketing strategy and business operations. 10. Why would I want to use Diamon-Fusion®? Diamon-Fusion® improves driver reaction which can prevent accidents. Diamon-Fusion® makes windshields optically clearer and drastically reduces glare. It improves visibility during inclement weather. And makes windshield 10X stronger reducing the likelihood of damage from small road debris. Diamon-Fusion® also allows insects to be easily washed away, and makes ice and snow much easier to remove. It protects against acid rain, corrosion and mineral buildup, and is resistant to UV rays. It makes windshield brighter and preserves the beauty and luster of glass surfaces.